Neff Packaging Systems is specializing in steel strapping, polyester and polypropylene plastic strapping and poly woven cord strapping. We have the strapping machines, strapping tools, accessories and technical service to provide you with a complete system. We can meet your strapping needs based on your specifications and unique applications. Let us know about your application and we‘ll help you determine the best solution. Product Description: The 1/2" runs a wide variety of polypropylene/polyester strapping and the 5/8" runs a variety of polyester strapping. Tensions, seals and cuts. Product Description:Manual seal feed for a wide variety of 1/2" polypropylene/Polyester strapping. This tool tensions, seals and cuts. 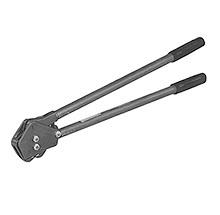 Product Description: Batter operating plastic strapping tool for polyester and polypropylene strap. Product Description: This powerful, one button operated tool is used for high strength polyester strapping. Product Description: Feedwheel tensioner for high strength polyester strapping with a built-in cutter for increased efficiency. Product Description: Manual seal-feed for combination tool for a wide variety of 5/8" polyester strapping. Seals and cuts. Product Description: *New* Can run manual, semi, or fully automatic. For 3/8" to 5/8" polyester or polypropylene. Tension from 88-550 lbs. Product Description: Semi and fully automatic for use with 5/8" and 3/4" polyester strapping. Weighing just 9.3 lbs, it has a tension rating of 88-880 lbs. Product Description: Side-action/single notch heavy duty sealer designed with Signode "I," "OF" and "P" series seals. Used with 1/4" x .029-.031. Product Description: Front action/crimp style 5/8" sealer. Designed for use with 58DY series seals. High strength, light weight. 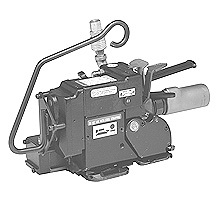 Product Description: Front action/crimp style sealer designed for use with "50DY" and "50DYS" series seals. Product Description: Side-action/single reverse notch heavy duty sealer designed for use with Signode "I," "OF" and "P" series seals. To be used with 1 1/4" x .029-.044. High strength, lightweight, minimal effort required. Product Description: Multi-purpose feedwheel tensioner. Runs a wide range of 1/2" polypropylene/polyester strapping. Product Description: Heavy duty/high tension. Runs a wide range of both 1/2" and 5/8" polypropylene/polyester strapping. Product Description: Pneumatic, feedwheel tensioner. Runs 3/4"-1 1/4" x .031-.044. Air pressure provides uniform tension with minimal operator effort. Product Description: Pneumatic sealless combination tool available in 5/8" and 3/4" and runs a variety of polyester strapping. Product Description: Pneumatic sealless combination tool. Available in 3/8", 7/16" and 1/2". Runs a wide variety of polypropylene and polyester strapping. The VT 10/13 has been called the most innovative tool in it's class. Product Description: Heavy duty, pneumatic tension-weld combination tool for polyester strapping. Applies over 800 lbs. of tension with minimal operator effort. Extremely durable.